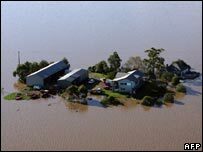 A flood-isolated Australian town was in danger of running out of beer this week until emergency volunteers came to their rescue. Residents of Hinton, New South Wales, were stranded following the severe storms that hit the region on Sunday. There was concern that their pub would run dry before a rugby league match which was due to be played between New South Wales and Queensland. But the State Emergency Services boated in a huge beer delivery just in time. The pub has become a meeting point for stranded residents, Matt Turner, the owner of Hinton's Victoria Hotel, told the Australian Associated Press news agency. "It's a very close community and everyone has been having a great time at the pub just catching up." The State Emergency Services (SES) have been using two flat-bottomed boats to deliver essential supplies to the town, which is expected to be cut off until Friday. In total, 12 kegs and three crates of beer were delivered. "There was some extra room on a boat after the essentials were loaded this morning," said SES spokesman Philip Campbell. "So they will be able to watch the game and have a cold one tonight."